In 2014, the IAIA Museum of Contemporary Native Arts (MoCNA) created a 10-day Social Engagement Art Residency program which has been in existence for the past four years. MoCNA’s Social Engagement Art Residency was funded by the Smithsonian’s National Museum of the American Indian (NMAI) through the Artist Leadership Program for Museums and Cultural Institutions up until 2017. This partnership offered us the flexibility to mold a program based on Native artist social engagement and impact that met the objectives of the Smithsonian while supporting MoCNA’s goals in terms of activating contemporary Native artist leadership, capacity and community building and the Native American Fine Art Movement. The museum serves as a catalyst for artists to generate community dialogue and dynamic experiences. The MoCNA Social Engagement Residency realizes socially engaged art projects that celebrate and engage the vibrant community that IAIA, MoCNA, and Santa Fe offers. The Museum looks to enable contemporary Native artists to negotiate and position community driven Indigenous narratives within the public sphere. Currently we have been able to continue this work, by a grant from the Andy Warhol Foundation for the Visual Arts who have been funding the residency starting in 2017–2019. MoCNA is a catalyst for artists to generate community dialogue and dynamic experiences. The MoCNA Social Engagement Residency realizes socially engaged art projects that celebrate and engage the vibrant community that IAIA, MoCNA, and the Santa Fe community have to offer for ten days. 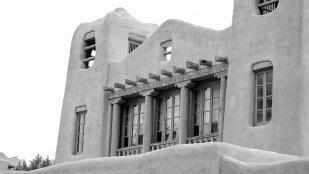 MoCNA facilitates a residency program in Santa Fe that will offer four Native artists the opportunity to access the MoCNA collection and create a socially engaged art piece with the support of the museum, the Institute of American Indian Arts (IAIA), and the Santa Fe community at-large for 10 days. MoCNA will pair two contemporary Native artists to support a wider dialogue. As a result, the artists will engage in the flexibility to brainstorm and work together during the creative process. However, this pairing would still represent a two-person showing of works created, rather than a collaborative final artwork. Residents will also participate in a variety of public programming and community engagement. MoCNA’s residency includes a 400-square-foot working studio in the museum proper and technical support by the way of a consultant. The purpose of this strategy is to enable contemporary Native artists to negotiate and position community-driven Indigenous narratives within the public sphere. Artists also will spend time in the MoCNA’s National Collection of Contemporary Native Art to aid in the creative process by drawing from one of the largest collections of contemporary Native art in the world. They will also have the opportunity to engage three other collections while in Santa Fe. During the visit, it is our intent that the artists will connect and contextualize ideas through examining discourse from our collection. By hosting the residency for Native artists, fostering partnerships with cultural and educational organizations, and integrating community engagement, MoCNA seeks to transform Santa Fe into a hub for positive social change that reflects the needs of the community and artists. Like-minded institutions and social networks already being nurtured by MoCNA, including organizations, Native and non-Native artists that live and work in the cultural hub of Santa Fe, would work together in ultimately creating a socially engaged art piece. Residents will also be provided access and exposure to other local museums collections. The final piece could cover various media and wide range of project methods that engage the community or specific facet of the community in a strategic manner that produces both artful and social outcomes to address issues under the rubric of sustainability, which is a high priority issue for IAIA (e.g., water, land use, transportation, globalism and language). While the outcomes of social practice art could result in video installations, sound installations, photography, prints or murals, which function perfectly within a museum or gallery context, sometimes the results are also realized in the relationships themselves, in shifts of community power, community-driven strategies and social infrastructures that resolve pre-existing conflicts, traumas or social injustices. The museum will document the process. Social practice art has been positioned by significant contemporary art institutions like MOMA/PS1, Whitney Museum, Queens Museum of Art, The Hammer, LAMoCA and the ASU Art Museum as a means of expanding the reach of museums beyond their respective walls and into specific communities. In this regard, the social art practitioner purposefully builds a dialogical bridge between the museum and community leading to greater, long-term community relevancy and participation. It’s important to note that social practice art is particularly relevant to Indigenous art practices because it relies upon relationships, respect, protocols and reciprocity, while working toward insights into community self-determination, and community-driven processes that define the sovereignty of context. Social practice art is an interdisciplinary means of contemporary art production that utilizes social space, social relationships and specific communities of interest as mediums to recover knowledge and re-define notions of power and agency pertaining to a broad spectrum of social, cultural, psychological, political and economic issues within a particular place or geography. MoCNA seeks discourse-driven Native artists for the program. The creativity of this program will diversify, strengthen and advance knowledge and expertise in the Native arts field. Ultimately, MoCNA can be a catalyst for artists to create community dialogues and creating dynamic experiences. Our goal is to realize projects with the artists that recognize and support contemporary Indigenous discourse and celebrate and engage the vibrant community that MoCNA and Santa Fe community have to offer. Nathan Young (born 1975, Tahlequah, OK) is a multidisciplinary artist and composer working in an expanded practice that incorporates sound, video, documentary, animation, installation, socially engaged art and experimental and improvised music. Nathan’s work often engages ritual, trance, the spiritual and the political and often incorporates indigenous sacred imagery in order to complicate and subvert perceived notions of the sublime. Nathan was a founding member of the interdisciplinary indigenous artist collective Postcommodity and received his MFA in Music and Sound at Bard College’s Milton-Avery School of the Arts where he studied with artist composers Marina Rosenfeld, Bill Dietz and Laetitia Sonami. Nathan is of Pawnee, Delaware and Kiowa decent. My project culminated in a compilation of these event scores in a publication called HYIAF YLOH. It is my hope that the community organizations that I engaged with, Creative Santa Fe, Communities in Schools New Mexico, Adelante, Santa Fe Indian School Leadership Institute and Kitchen Angels will be able use these books as a guide or set of instructions for the performance of these scores. I also have included in this publication, many of my research findings to add more context to the work being done by these organizations. This residency afforded me the opportunity to explore the history and form of event scores, while at the same time engaging with community organizations working in Santa Fe who provide important essential services in their community. Working as a resident artist in the IAIA Museum of Contemporary Native Arts and the Smithsonian National Museum of the American Indian Social Engaged Artists Residency in April of 2015 gave me the opportunity to engage community service organizations in a way that I felt was innovative and productive for both my artistic practice and the organizations that were involved. For my residency, I chose to explore the event score, involve simple actions, ideas and objects from everyday life recontextualized as performance. Event Scores are texts that can be seen as proposal pieces or instructions for actions. The idea of the score suggests musicality. Like a musical score, Event Scores can be realized by artists other than the original creator and are open to variation and interpretation. Working with event scores seemed to be a very appropriate mode to engage with communities in Santa Fe and a way to explore my own concerns with both Socially Engaged Art (SEA), sound, performance, and poetics. Steven J. Yazzie (b.1970) Newport Beach, California; lives and works in Phoenix, Arizona). Yazzie a proud member of the Navajo Nation and has served honorably with the United States Marine Corps. He received a Bachelor of Fine Arts degree in Intermedia at Arizona State University and was named the 2014 outstanding graduate for the Herberger Institute for Design and the Arts. He also studied at Skowhegan School of Painting and Sculpture, Maine. Yazzie has been apart of numerous regional, national, and international exhibitions. Most notably he has exhibited at the Museum of Modern Art, New York, NY; National Museum of the American Indian, New York, NY; National Gallery of Canada, Ottawa, Art Gallery of Ontario, Toronto, Canada; the Museum of Contemporary Native Art, Santa Fe, NM. Throughout Arizona, Yazzie has exhibited at the Heard Museum, Phoenix Art Museum, Arizona State University Art Museum, Scottsdale Museum of Contemporary Art, Tucson Museum of Contemporary Art, Tucson Museum of Art, and the Museum of Northern Arizona. Yazzie’s work can be found in a number of public and private collections throughout the country. Yazzie has also received a number of regional and national grants; Mid Atlantic Arts Foundation, National Endowment for the Arts, The National Museum of the American Indian, the Arizona Commission on the Arts, and the Joan Mitchell Award. Knowing You, Santa Fe is a data driven community activated film project utilizing community input as the primary source material. Knowing You, Santa Fe utilizes an online survey and a focus group environment to collect qualitative data from willing participants. Participants who take part in the online survey and the focus group will be instrumental in designing and influencing a conceptual framework, establishing formal structures, and determining parameters for a site-specific film. The methods and techniques of conducting research are part of a process of community engagement exploring the space of universal value systems, in hopes of using data in meaningful ways and attaining a greater understanding of a community, while re-contextualizing and rationalizing aesthetics of place. Knowing You, Santa Fe, was a project I developed while on the social engagement residency at the IAIA Museum of Contemporary Native Arts. The project was partially planned and designed through an on-going conversation I had with project manager, Andrea Hanley, and consultant Kade Twist. They both helped me establish the framework for the success of the project. Once I arrived in Santa Fe I was again supported greatly by the staff at the Museum and all the resources I needed for the project were available to me. It was also nice to have another artist, Nathan Young working on his own project during the residency. The opportunity for peer-to-peer feedback and process orientation was helpful throughout the residency timeline. I think the ten-day period for the residency was perfect amount of time for my particular project, since I already had the groundwork established before I arrived. Over all I think the Social Engagement Residency Program at the IAIA Museum of Contemporary Native Arts is a needed and essential program for contemporary art practice today. It stands out to me, as an example of what native art museums should embrace because contemporary indigenous artists are already working in the sphere of social practice and will continue to be. Therefore we will be in constant need of institutional support and reinforcement to broaden our collective aspirations in the art worlds and beyond. I’m really excited about the work I produced, and the new friends and collaborators I was able to make because of this residency. I’m grateful for the opportunity and hope this kind of activity continues for many years to come. Along with a twin brother, Zakary Starr in 1980 to Gregory Morse of Torrington, Connecticut and Nora Naranjo Morse of Santa Clara Pueblo, New Mexico. Interests: Learning, figure drawing, farming, house building, emotion, staying hydrated, Ceremony, anthropomorphism, the human experience, color, temporary tattoos, discussion, trash, stretching, partnership, and becoming a good person. Eliza has shown her work domestically and internationally at Cumbre de el Tajin, (Veracruz, Mexico); Ekaterinburg Museum of Fine Arts, (Ekaterinburg, Russia); Chelsea Art Museum, (New York, New York); SITE Santa Fe (Santa Fe, New Mexico); Axle Contemporary, (Santa Fe, New Mexico); Heard Museum (Phoenix, Arizona); Berlin Gallery (Phoenix, Arizona): School for Advanced Research, (Santa Fe, New Mexico), Eliza currently works in Chimayo, New Mexico. The world is becoming culturally integrated, filled with technology and overwhelmed with tangible items made of materials that don’t disintegrate. I believe my communities ethnic diversity and celebration of interdependence strengthens our potential to gracefully navigate through this new era with ancestral value systems. Our story, ‘Sunrise, sunset. Sunrise…’, aims to embrace this navigation as an art practice and express the subtle power and endless potential of this long term collaboration with the earth. It was my intention to acknowledge acts of daily life as art, to recognize that the art practice of social engagement embraces traditional pueblo value systems of renewal, rescoucefulness and relationship, and to apply these value systems to a contemporary context. It is my hope that this recognition will encourage a revival of looking at our relationship to the land around us a creative act. For eight days I will work with my collaborators on ongoing projects that both enhance the communities well being and strengthens it’s capacity to reach out. Projects will included preparing land for faming, planting and food collection, building a co owned cart that carries produce to neighboring communities, collecting material to repurpose at the reservation dump, and mud plastering. These days will be documented with photos and footage, then combined with historical images collected from family and partner museums to illustrate our story during the residencies interview process. By listening to several elders in my family talk about their thoughts on community, ceremony and change I created intention for my residency. During my residency I continued ongoing projects like preparing a garlic field for oncoming harvest, irrigated vegetables that have been growing for several months and planted corn, carrots, chili and kale with a seeding tool that was purchased with the support of the residency. This tool was used to plant our elderly neighbors corn as well. In other acts of renewal, resourcefulness, and relationship, a mud wall was plastered with my 11 year old pueblo cousin who had never plastered before, a sheep was sheered by several women, and the creation of a tricycle weeder for a neighboring farm was financially supported. Art by definition of renewal, resourcefulness and relationship is the work of this community. Fields are being farmed, animals raised, adobes made, machinery built, and trash being formed into fine art and tools. The MOCNA residency will by my first formal effort at recognizing this community as a socially engaged artwork that reaches Espánola, Chimáyo, Santa Fe and beyond through food, value systems being shared, and fine artwork. I believe there is no word for art in the Tewa language because Pueblo people looked at their entire existence creatively. Acts of renewal, resourcefulness and relationship created in collaboration with organic systems are the art forms of ancestors. Sunrise, Sunset, Sunrise…, in September 2018 is still ongoing. This project provided tools and information to make people’s connection to their land, histories, cultural values, and community stronger. The artwork cleared a path to remember, celebrate, and acknowledge that before we defined art through western constructs we looked at our entire lives as a creative process. Laura Ortman is a White Mountain Apache, is a Brooklyn composer, musician, visual artist, and hairstylist. Currently, she is recording her third solo album with Gowanus engineer Martin Bisi, playing violin, Apache violin, electric guitar, amplified piano, Casio, pedal steel guitar, vocals, samples and field recordings. She has collaborated with great artists, filmmakers, dancers and musicians from New York, New Mexico, Italy and Canada. She has performed and recorded with New York bands Stars Like Fleas, The Dust Dive, Black Mirror Picnic, Raft’s Assemble, and White Hills. In the fall of 2014 she was awarded a five week Rauschenberg Residency for music in Captiva, Florida. In 2008, she founded the Coast Orchestra, an all-Native American orchestral ensemble performing and improvising to the 1914 original score to photographer Edward Curtis’s only film “In the Land of the Head Hunters” to sold-out audiences at the National Gallery of Art in Washington, D.C., and the American Museum of Natural History in New York. My plan is to pin down ideas of where to record after taking in the various museums art and video collections and community, and researching different areas of Santa Fe until and during my arrival, using maps, online resources, word-of-mouth recommendations from area types, outlandish and incidental ideas, nature and homes. While mapping out the locales of Santa Fe, I’ll meanwhile gathering resources to construct the mobile recording unit (MbRU). It is how I would like to interact with Santa Fe as an outsider but also as a visitor/resident for ten days. I know Santa Fe is home to people who have lived their entire lives there, but also its home to a slew of population who come through on a temporary, fluctuating basis. Both are real and have outstanding visceral qualities. I don’t want to project onto Santa Fe that I know what its all about, but rather reach towards a specific aspect of it to learn and develop an audio dialogue of what it will have meant to be there. I want to capture some of these aspects to make an audio collage to help note what the Santa Fe community sounds like, from the inside and outside. I have an interest in the flexibilities of music and sound that create environments all their own. I am interested in creating an audio soundtrack collage of Santa Fe that reflects its community, surroundings and tendencies. I’ve decided to develop a mobile, self-contained, audio recording structure to transport to different areas of Santa Fe for daily recordings of local musicians, artists, sounds, interference, coincidences, and beyond. The soundtrack will be further enhanced and edited by area musicians who I want to collaborate with in developing, specifying and personalizing the sounds of Santa Fe. As a multi-instrumentalist, performer, composer and improviser, as well as a visual artist, I’ve considered to use my collaborative strengths that will contribute to this residency. As a New York City resident since 1997, I’ve walked, collaborated and journeyed all over the city, still discovering things that bring me new perspective as to where I live. Even though I call NYC home, I know that I am never going to know or understand it fully because I still am a mobile, passer-by in the larger scheme of things. It’s inspiring to keep discovering its ongoing potential from an outside and inside view. Audio recording: “Soundtrack of Santa Fe” with Rose B. Simpson, Thollem McDonas, Carlos Santistevan and Laura Ortman, will be available November 2015.